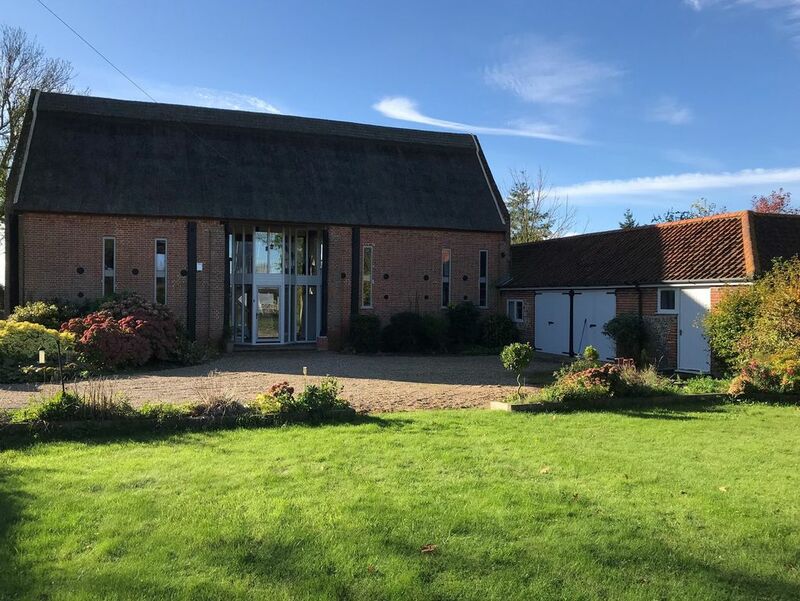 Situated amongst picturesque Norfolk countryside and with a multitude of local attractions appealing to all ages and tastes meaning there is never a shortage of places to go. Explore and experience the raw natural beauty of the Broads by boat or using the myriad of walks and cycle tracks. Nature lovers will relish the opportunities to spot rare species in the dramatic landscapes of the National Park. The nearby coast offers unspoilt sandy beaches at Winterton seal watching at Horsey and traditional family fun in Great Yarmouth. Entertaining days out can be found at various local attractions including BeWILDerwood Africa Alive The Dinosaur Aventure Park and the National Trust s Blickling estate. This unique property offers a wealth of space throughout yet still retains a warm and welcoming feel. Guests will enter via the wonderful main entrance hall with floor-to-ceiling windows and staircase to the first floor. Moving through to the lounge the barn s period features such as decorative inglenook fireplace exposed brickwork and beams provide a stylish homely and characterful setting in which to enjoy time with the family on the comfortable sofas while relaxing in front of the TV and Blu Ray DVD or playing board games. The contemporary kitchen/breakfast room with vaulted ceiling is spacious and allows for people to be seated around the breakfast bar while others prepare the meals. The kitchen is a cook s dream with a Aga style oven and electric hotplate microwave fridge Nespresso machine freezer a useful chiller drawer and a dishwasher. A washer/dryer can be found in the utility room. Leading off the kitchen is the dining room again with vaulted ceiling and wonderful exposed brickwork which creates a fantastic space to dine. The games room is a great place to spend any downtime and accommodates an American style pool table a seating area with TV and for the adults a bar area. There are three bedrooms found on the ground floor a super-king-size zip-and-link (which can be made into a twin on request) with an en-suite bathroom with bath separate shower and WC a king-size bedroom and a single bedroom with an additional single pull out bed and finishing the ground floor is a separate WC. Moving up to the first floor the light and airy landing provides far reaching views and offers a great spot to relax on a chaise longue and enjoy a morning coffee. Off the landing are three bedrooms the master with vaulted ceiling complete with four-poster king-size bed with en-suite bathroom with shower over bath and WC one super-king-size zip-and-link (which can be made into a twin on request) and a single bedroom with an additional single pull out bed. Completing the accommodation is the main bathroom with hand held shower over bath separate shower and WC. The owners have provided various baby/toddler equipment/ and games details available on request. Venturing outside guests will enjoy the delightful fully enclosed rear garden which acts as a suntrap with seating including a summerhouse providing a superb drinks area in the late evening. To the front is a larger lawn with shed for cycle storage. There is ample parking for five cars. Fantastic barn for large families and groups. We celebrated our mums 70th birthday and the owners were more than helpful and very welcoming with some nice little touches left for our stay. The games room gave the children plenty of space to run around. Great entertaining space in the kitchen and good outdoor space. Lots to do close by and if your happy to drive a few miles, there’s plenty to do with several beaches etc... highly recommend a visit!